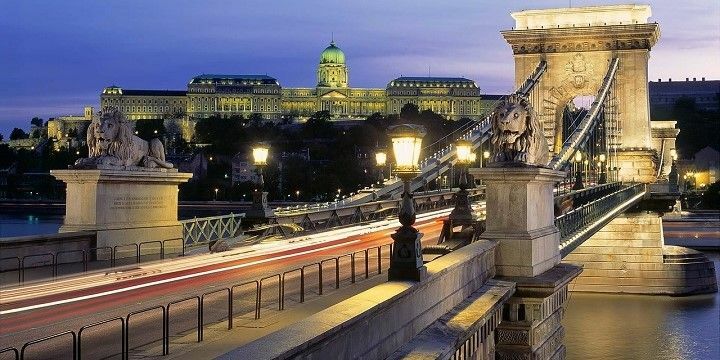 Hungary’s capital, Budapest, was created when the cities of Buda, Óbuda, and Pest were unified in 1873. Whilst Buda, west of the Danube, is somewhat calmer and more historic, Pest on the eastern side, has more nightlife, shops, and restaurants. The Chain Bridge was the first permanent connection of Buda and Pest. It opened in 1849, before the two areas were officially unified. The 375-meter-long stone bridge — with its huge lion statues at either end — is one of Budapest’s best-known landmarks. According to an old story, the bridge’s sculptor ashamedly jumped off his creation and into the Danube during its opening ceremony, when a boy pointed out that the lions don’t have tongues. The Chain Bridge leads right to Castle Hill. Other beautiful bridges in the city include the green Liberty Bridge and Margaret Bridge. The latter might seem less striking at first sight, but look a little closer and you’ll be amazed by its detailed design. It also leads to Margaret Island, where you’ll find a beautiful park, with artistic sculptures, famous musical fountains, and medieval ruins —a great place to unwind after tiring yourself out from exploring the city. Budapest’s 125 thermal springs and spas offer alternative relaxation spots for locals and visitors alike. During your walk along the Danube, you’ll see the Gellért and Castle Hills: great spots for breathtaking views over the city. 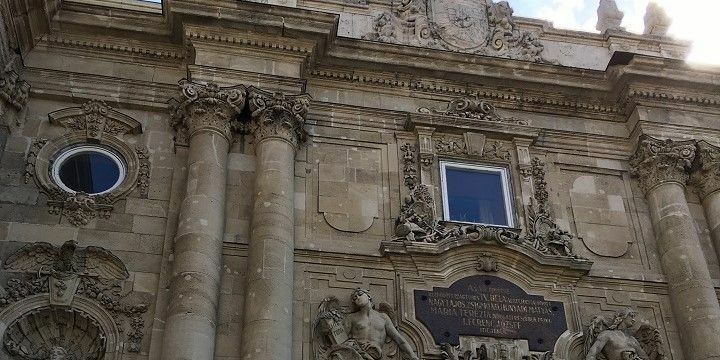 The latter offers a mix of historical landmarks and impressive architecture. Its limestone plateau — which lies 170 meters above the city and is home to the Royal Palace and Holy Trinity — is a great place to spend a couple of hours. Castle Hill offers a mix of historical landmarks and impressive architecture. One of the castle’s most popular lookout points is Fishermen’s Bastion: legend has it that fishermen defended Budapest from this point during the Middle Ages. On the other side of the river, you’ll find the Hungarian Parliament, the world’s largest parliament building! If you’re interested in taking a tour through its golden chambers, make sure to book in advance, as spots fill up quickly. 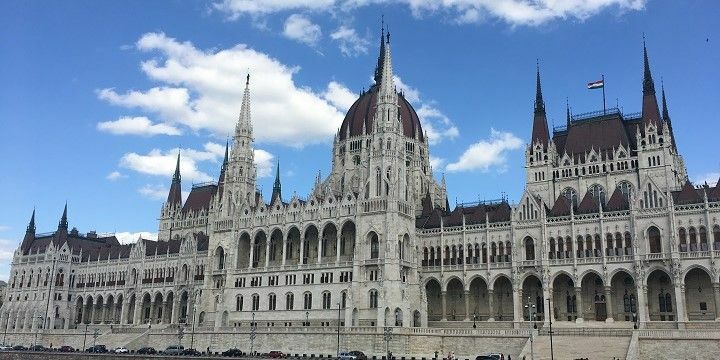 The Hungarian Parliament is the world's largest parliament building. The Shoes on the Danube memorial might be easier to miss, but is no less important to the city’s heritage. 60 pairs of metal shoes were created in honor of the Jews who had to take them off before being executed during the Second World War. Walk away from the Danube and into Pest’s center, and you’ll come across Andrássy Avenue. The famous 2.5-kilometer-long boulevard is lined by landmarks, such as the opera house, and the House of Terror, as well as chic boutiques, restaurants and bars. Along with Heroes’ Square, this avenue is home to many fun festivals throughout the year. Make sure to visit Vajdahunyad Castle in the park behind the square. The building resembles a Transylvanian castle and demonstrates 21 different architectural styles. It was initially built from paper, wood, and cardboard, and was supposed to be torn down again after the Hungarian Millennium of 1896. However, locals and visitors were so fond of the new creation, that it was later rebuilt as a permanent structure. Be sure to take an evening river cruise down the Danube to see the city’s beautiful nighttime illuminations. Afterwards, head over to the Jewish Quarter, which is home to many lively bars, pubs, and clubs. Here, you’ll find many of the city’s famous ‘ruin bars’ decorated with some bizarre items. Spending an evening in one of these old, crumbling buildings will make your trip to Budapest unforgettable! If NextStop24 helped you to choose your next travel destination, we'd be very grateful if you’d search for your accommodation and things to do in Budapest through these links. They're affiliate links, which means that we will receive a small commission for every booking made through them. There are no extra costs for you; you'll simply be helping to keep NextStop24 running. Thanks! Budapest is such a beautiful still, and everything is very affordable. We had dinner in a pretty cheap small restaurant and it was delicious! One of my favorites was a boat tour on the Danube.